What is a Krav Maga kobutan? It is the same thing as a regular Kobutan but it is being handled with an Israeli attitude. 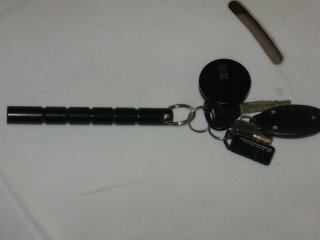 The kobutan is a metal key chain, a small 'stick' that is legal to carry and is amazingly effective as a self defense tool. I was first introduced to the kobutan by Professor Arthur Cohen, a self defense and pressure point expert. Since then I have added many techniques in the Krav Maga style. What I mean by adding the Krav style is that we use it a little more aggressively; we do things that are not "politically correct"; things that might be considered excessive by Western Liberal standards. In Israel we think survival first, appropriate later. Like much of the martial arts itself this little device was developed by a Japanese fellow but its usage has been transformed by Israelis. Amazingly enough Israelis are now invited to China to teach practical self defense. The circle has come full term. The kobutan will not be useful in winning the UFC or the world boxing title. However if you are grabbed, caught in a choke hold, faced with an attempted abduction, caught in a bear hug, or anything along these lines the kobutan could be your best friend, if you know how to use it. I call it the great equalizer because in a short amount of time you can learn to use the kobutan in such a way that you will equal, or superior to, your attacker. You may be smaller or less muscular but the kobutan will equalize that equation and allow you to escape. How can you learn how to use it? Either find a qualified instructor, or order our Krav Kobutan DVD. Find a partner, go over the techniques many times, understand to apply this great device in a variety of situations, and you feel and be, greatly empowered. A kobutan can be purchased at any of the on line martial arts stores, such as Asian World of Martial Arts, Century etc.